There's a lot of competition among the top VPNs for the USA. Whether you want a VPN to access US TV and websites from outside of America or you are already in the US and want a VPN suitable for fast, private browsing, we've rounded up 5 of the best. The aim of many VPN users throughout much of the world is to tunnel into the United States by providing a US IP address. The US is, after all, the source of the world’s most popular entertainment, and much of it is only accessible online to those living there. But US citizens also need VPNs, whether it be to unblock content or improve privacy. The needs of an American VPN user is probably a bit different than someone in a foreign country. Short for Virtual Private Network, a VPN encrypts all of a device’s internet traffic and routes it through an intermediary server in a location that the user chooses. ExpressVPN Our #1 pick. Leads the way on speed, security, and privacy. Unblocks geo-restricted streaming content with ease. Effortless to set up and use. Includes 30-day money back guarantee. NordVPN Huge global network of servers that can unblock popular streaming content and geo-restricted sites. Decent speeds and strong security. CyberGhost A fast low-cost VPN with strong privacy features. Unblocks popular streaming content. PrivateVPN Fast speeds and can unblock most restricted content. Manual configuration can be challenging. SaferVPN Good speeds, privacy, and unblocking abilities. Easy to use. Buffered Decent speeds and privacy but lacks popular security features. Hide.me Downloading, torrenting and P2P specialist. Good privacy but pricey. AirVPN Unmatched security, Tor-friendly. Needs manual configuration. Americans are directly in the line of sight of intelligence agencies like the FBI and NSA. American corporations like Google and Apple monitor and gather information on users in the United States. As Edward Snowden revealed to the world, corporate and government espionage are often one and the same. While those government agencies and private companies are global and spy on everyone, Americans fall under the direct jurisdiction of their authority, whereas users in other countries at least have a legal border between them. Copyright trolls are particularly aggressive toward torrenters in the USA. ExpressVPN uses AES 256-bit encryption with the OpenVPN protocol by default. No traffic logs are kept that show the content of user activity, but some metadata is recorded. The company is incorporated in the British Virgin Islands, beyond the jurisdiction of the US government (and UK government, in case you were wondering). All servers use shared IPs, so you share an IP address with hundreds of other users. The company accepts payment in Bitcoin in addition to credit card and PayPal. Apps are available for Windows, MacOS, Android, iOS, Linux (command line), and certain routers. 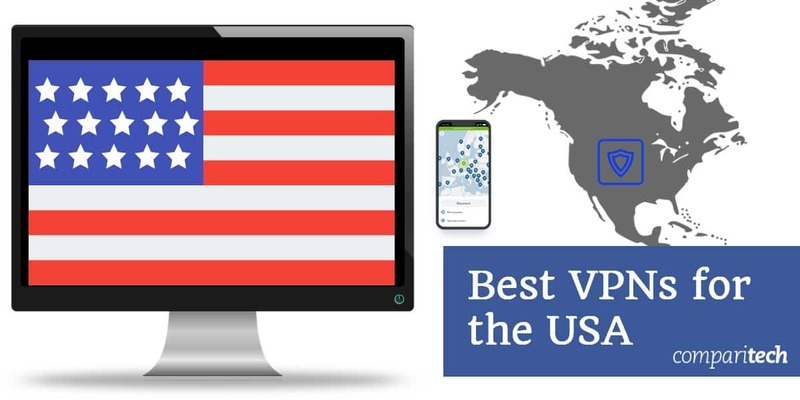 BEST VPN FOR USA:ExpressVPN is our #1 choice. A blazing fast and reliable choice which unblocks all major streaming services including Netflix, Hulu, and Amazon Prime. Expect buffer-free HD viewing and total security and privacy. Popular with torrenting and P2P users. Try it risk-free with the 30-day money back guarantee. NordVPN is a Panama-based VPN provider with a reputation for security. That includes double-hop servers that route your traffic through two VPNs and a Tor over VPN option that sends traffic through the Tor network upon exiting the VPN server. Most IPs are shared but some dedicated IP servers are also available if needed. The OpenVPN protocol uses 256-bit encryption standard. NordVPN accepts Bitcoin payments, and it’s one of the best values any VPN provider offers. The company keeps absolutely no logs of users’ traffic or connection metadata. You may have up to six simultaneous connections on a single subscription. BEST BUDGET VPN:NordVPN offers great value. A good all-rounder that works well with most popular streaming sites. Strong security and privacy features and allows up to 6 devices to be used simultaneously from one account. Includes 30-day money back guarantee. CyberGhost is based in Romania and offers a varying selection of privacy and security features to choose from. The company keeps no logs of user activity or metadata. OpenVPN connections are secured with 256-bit AES encryption and perfect forward secrecy. DNS leak protection and a kill switch ensure no traffic escapes the VPN tunnel. Additional features include an ad blocker, anti-malware defense, and anti-tracking. CyberGhost allows you to choose a server not just based on location, but on how you plan to use it, be it for streaming, torrenting, public wi-fi, or anonymous web surfing. BEGINNERS CHOICE:CyberGhost is easy to use. A budget choice that is great on privacy and security. Unblocks Netflix but can struggle with other popular streaming sites. 45-day money back guarantee. Based in Sweden, PrivateVPN is a relatively young provider compared to the others on this list. Despite that, it’s growing quickly thanks to features and performance on par with the bigger names. The company adheres to a strict no-logs policy. 256-bit AES encryption and perfect forward secrecy protect all traffic on the OpenVPN protocol. A kill switch halts all internet traffic if the VPN connection drops. Built-in DNS leak protection prevents web page requests from being sent outside the encrypted tunnel. PrivateVPN is one of the faster VPN services we’ve tested and unblocks just about everything we’ve thrown at it. P2P filesharing is tolerated on all servers. Six simultaneous connections are allowed on a single plan. Great Speeds:PrivateVPN is a good family choice that can connect 6 devices simultaneously. Great privacy and high speeds. It’s also capable with streaming sites like Netflix and is suitable for torrenting. Would prefer 24-hour chat support. 30-day money back guarantee. Israel-based SaferVPN offers the privacy and security you need in an app and service that couldn’t be easier to use. A subscription nets you access to hundreds of servers in more than 30 countries. That’s not a huge selection when compared to some competitors, but rest assured that our speed tests score SaferVPN far above average across the board. The company doesn’t record the contents of traffic or log IP addresses. Servers optimized for streaming can unblock a slew of streaming video sites in the US and UK. All connections are guarded by 256-bit AES encryption. Simple Interface:SaferVPN achieves HD speeds. Reliably unblocks popular streaming content and has great privacy and security credentials. Lacks some popular features. Includes 30-day money back guarantee. Hungary-based Buffered doesn’t keep traffic logs, but it does record the user’s IP address, time connected, and connection duration. DNS leak protection works well, but there’s no kill switch. 256-bit encrypted OpenVPN connections are standard. The desktop app is novice-friendly, but mobile users will have to opt for a third-party app until the company eventually releases Android and iOS versions. All server IP addresses are shared. Unfortunately, Buffered does not accept Bitcoin. SIMPLE TO USE:Buffered hit good speeds in our testing. A solid general purpose performer. Great desktop interface but mobile users require a third-party app. On the pricey end of the scale. 30-day money-back guarantee. Hide.me is a Malaysia-based VPN provider that keeps zero logs of users’ activity and metadata. It’s one of the fastest VPNs we’ve tested to date. Users can choose from a variety of available protocols, although we recommend OpenVPN or IKEv2 for optimum security. Each VPN connection on those protocols nets you 256-bit AES encryption and perfect forward secrecy, more than enough to keep your security airtight. It’s not the most adept unblocker when it comes to geo-locked sites like Netflix, but for most Americans this won’t really matter. Certain servers are labeled for P2P filesharing activity. Apps are available for Windows, MacOS, iOS, Android, and Windows Phone. Read our full Hide.me review. If you can live with the ugly interface and poor usability, AirVPN has no equal when it comes to security. Only the OpenVPN protocol is supported. For added privacy, OpenVPN encapsulated in SSH and SSL are on offer. DNS leak protection, DNS routing, a kill switch, and port forwarding can all be tweaked in the settings. Zero logs are recorded. The company is based in Italy. The app is targeted at more advanced users, but it shouldn’t be too difficult for a novice to get a grasp of. AirVPN accepts bitcoin. Apps are available for Windows, MacOS, Android, iOS, and Linux. SOLID PRIVACY:AirVPN is for the security conscious. A community run VPN network that places security and privacy concerns over ease of use. Works well with Tor but be prepared for manually tweaking parameters to get it working right. Due to privacy concerns, we filtered out several VPN providers from this list because they are based in the United States. That doesn’t make them bad VPNs by any means, but the fact that the NSA or FBI could come knocking on their doors doesn’t inspire confidence, even if they advertise a no-logging policy. Other than being based in the US, these VPNs meet all of our other criteria. If you trust them not to store any usage logs, then they shouldn’t have any information to give to law enforcement and intelligence agencies in the first place. Hola is a peer-to-peer VPN-ish browser extension that allows other members to utilize your unused bandwidth. It does not operate its own servers. This is a privacy problem, especially because Hola isn’t very transparent about it. The company allegedly took advantage of all its users’ network power to create a botnet and attack websites in the past. Because internet service providers often impose data caps in the US, and because of blatant privacy issues, we recommend avoiding Hola. HideMyAss is based in the UK. Because the US is good buddies with the UK, it’s not a good option for those hoping to avoid national intelligence agencies. HideMyAss infamously gave up user logs to British authorities that led to the arrest of a LulzSec hacker. HMA says it never logs the contents of its users’ internet traffic, but it does store detailed metadata logs that include users’ real IP addresses, which was enough for law enforcement to eventually jail LulzSec hacker Cody Kretsinger following his involvement in a cyber attack on Sony Pictures. Several free VPN services will try to entice you after a quick app store or Google search, but be wary of them. First off, they are typically slow, cap your data, and limit bandwidth to save resources. Secondly, they have poor logging policies and security. Finally, many free VPNs make money by injecting advertisements into users’ browsers, which actually decreases your privacy. Even though Americans typically have the best pick of content, they are faced with one persistent form of geo-blocking: blackouts. Blackouts restrictions usually apply to live streaming video, especially sports. Even if you have a subscription to a legal online streaming service, such as MLB.tv for baseball, local teams are often unwatchable online. That’s because the broadcast rights to local games are often bought up by regional TV stations, and online streaming services are barred from competing. VPNs circumvent this problem. By simply connecting to another location in the United States where the particular event is not blacked out, the stream can be unblocked. 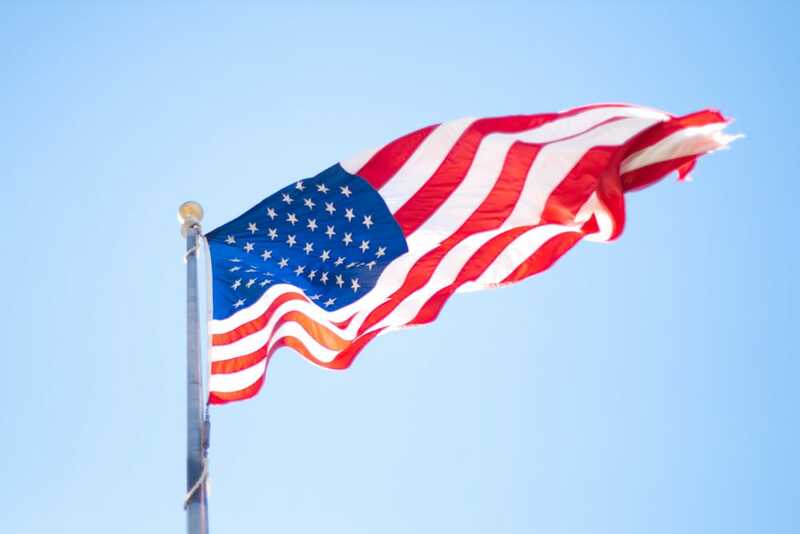 Just make sure you’re using one of our recommended best VPNs for USA to ensure you have enough data and bandwidth to get decent quality video without constant buffering. Check out our detailed tutorials on how to bypass blackout restrictions for MLB baseball, NHL hockey, and NFL football with a VPN and Kodi, a free home theater software. Downloading and distributing copyrighted material is illegal in the United States. Internet service providers often implement a three-strike rule in which customers are penalized for illegally downloading content via BitTorrent. While BitTorrent itself is not illegal, it’s often associated with illegal activity, primarily online piracy. Non-copyrighted material is completely legal to download. Copyright holders often act through copyright trolls, which record IP addresses of torrenters and send settlement letters requesting remuneration. Copyright trolls are granted the right to sue on behalf of the copyright holder. However, because an IP address does not legally constitute an identity in the US, it’s usually advisable for recipients is to ignore settlement letters if they don’t contain any identifying information. A VPN’s encryption hides BitTorrent traffic from the user’s ISP. And by masking the user’s real IP address with that of the VPN server, copyright trolls cannot trace torrent downloads back to a specific device.